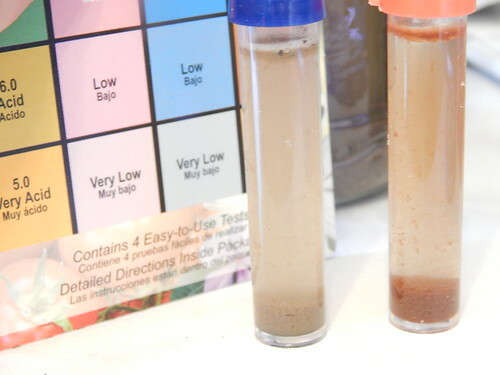 Can I Use a Home Soil Test Kit to Test My Soil? 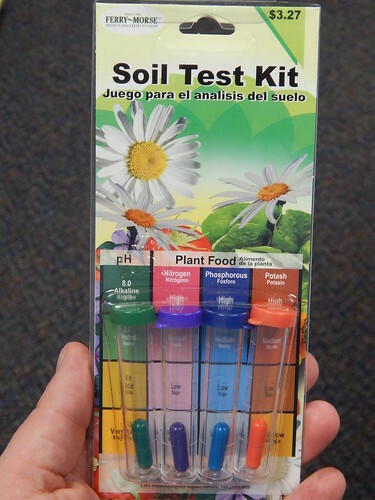 When I t alk about soil testing, one of the most frequent questions I get asked is if they can just use a soil test kit that you buy at a garden center rather than doing a lab test. (You can have a lab test done through K-State or through a private lab.) 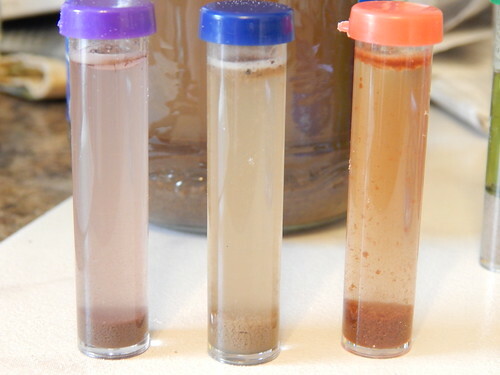 One of the biggest differences between a soil test kit and a lab test is that the kit just gives you a general idea of your soil characteristics, whereas a lab test gives you an accurate numerical value of your soil pH and nutrient levels. As you can see, it is a pretty cheap test at $3.27. 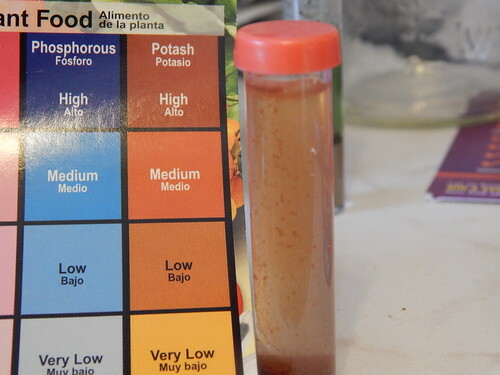 It tests the pH, nitrogen, phosphorus, and potassium. You compare the color of your final solution to the chart and using the comparison can amend your soil using recommendations from a tiny chart on the back of the directions. I made sure to read the instructions a couple times before starting and I had my phone at hand to act as the timer to make sure I shook things long enough and let them rest the right amount of time before reading the results. 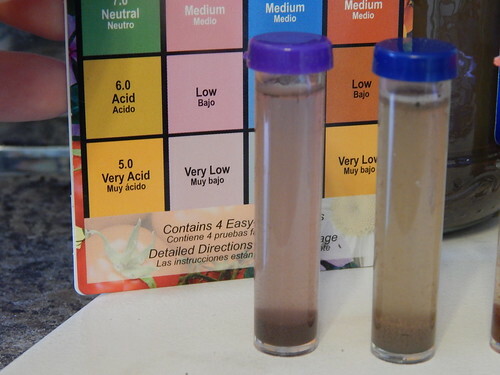 pH is a test of the acidity/alkalinity of the soil. The instructions were to take a scoop of soil from about 4″ deep and fill the green-capped tube to the first line. Okay, check. Can you see the first problem with this test? No? I’ll explain in a minute. Then you fill the tube with water (preferably distilled) up to the fourth line. Do you have distilled water right at hand? If not, are you going to stop everything and run out to buy 1 tablespoon of distilled water for a more accurate test? You’re right if you guessed that I didn’t, even though I know that our city water tends to run alkaline and that could possibly make the test less accurate. So, I added the water, added the capsule (Which you don’t just plop in, by the way. You have to open it and very carefully dump the powder into the tiny tube. Not fun. ), and shook thoroughly. I let it sit for the designated 1 minute, then compared the results to the chart. Well, what do you think? Can you tell what color that is? Yeah, I couldn’t either. It looks too yellow to be neutral, but too green to be acid (6.0). I guess that would put it somewhere in between the two, which would seem to be ideal. Of course, I also know that the tap water could be skewing that. So how does this result compare (ambiguous result notwithstanding) to the lab test? Well, my lab test showed a pH of 5.2. Yikes! That’s a BIG difference. Did you figure out the other problem with this test? 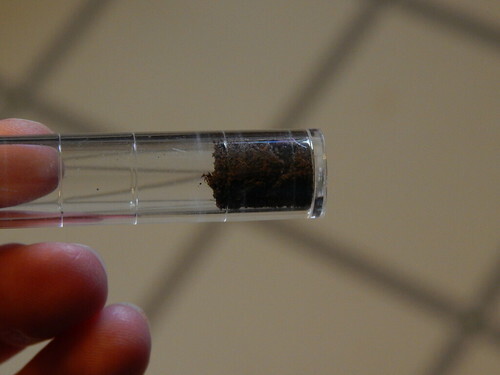 This test is only really testing the pH of that 1/2 tsp of soil I put in the tube. 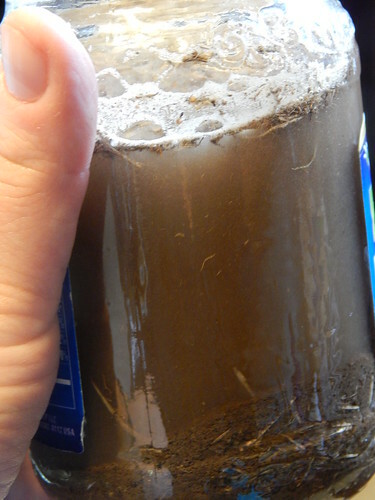 The pH of that small bit of soil could very well be 6.5. But the randomized lab sample tells me that the average for the entire area is 5.2. On this part of the test, I have to give the kit a big FAIL! There’s my jar as I’m getting ready to shake. One thing I realized after letting the soil settle for the requisite 10 minutes is that they don’t take into account a soil with lots of organic matter. I had to scoop all the floating organic matter off the top in order to get samples that were just water. After letting it settle for 10 minutes, I very carefully used a teaspoon to put water into my tiny plastic tubes, up to the fourth line. I needed a pipette, but didn’t have one. Do you have one kicking around your house? Yeah, didn’t think so. Then I very carefully poured the powder from each capsule into the tubes. I didn’t spill very much. Then I capped them and shook them “thoroughly.” The powder in one tube got stuck in a bubble at the top, so I had to open it, pop the bubble, and then shake again. Then I set my timer for 10 minutes to read the results. Here’s what I saw after 10 minutes. Hmm…Let’s take a closer look. Okay, so this is the Nitrogen test. There is a faint pink color. (I was confused because the cap was purple, but whatever.) I’m still skeptical of the color gradients, but it looks like something in the low-ish range. That would actually be fairly accurate with where my soil test came out. Nitrogen tends to fluctuate a lot, but I hadn’t fertilized at all, so I’m not surprised to see this rating. Now the phosphorus. I apologize for the blurry photo. My camera couldn’t decide what to focus on. So, I’m a little disappointed in this one. Based on the chart, I would almost call this lower than very low. My lab test result came back at 46 parts per million, which would put me in the “medium” range for fruits and vegetables. On a lawn, that would put it into the “high” range for phosphorus. I suppose that is another limitation of this test. It assumes that what is considered low, medium, or high is the same regardless of what you are growing. Last, the potassium. Do I decide based on the flecks or the liquid color? I’m not sure. This was the one that had the bubble, so maybe I didn’t shake it enough afterwards? At any rate, it seems like it is in the low to medium range. My lab test put me just over the bubble into high, so it isn’t super accurate either. So here is their chart of what to apply. The rates are in oz/100 sq. ft using the fertilizer listed. 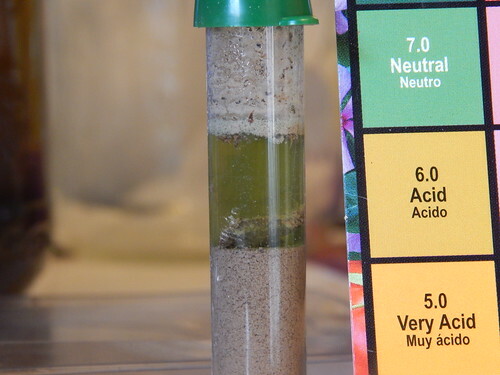 The actual fertilizer recommendations aren’t too bad, providing that you managed to accurately determine which level you were in for each nutrient (and that the test was actually accurate itself!). 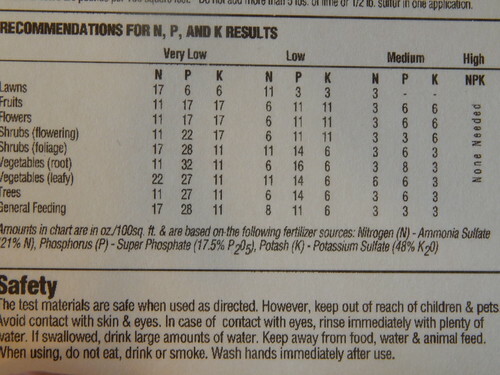 The soil pH recommendations aren’t too bad either, except that they give such a huge range in some cases. If I needed to change my loamy soil by 1.0 pH level to make it more acidic, it recommends 1 to 3 pounds of sulfur or iron sulfate. That’s quite a big range! This probably won’t come as a huge surprise to you, but after doing this test, I don’t think that a test kit like this is really worthwhile. I know there are more expensive kits that can be reusable, but in this instance, you don’t really get any useful information that you can rely on. When you get right down to it, any soil test, whether with a kit or done in the lab, is only as good as the sample you started with. 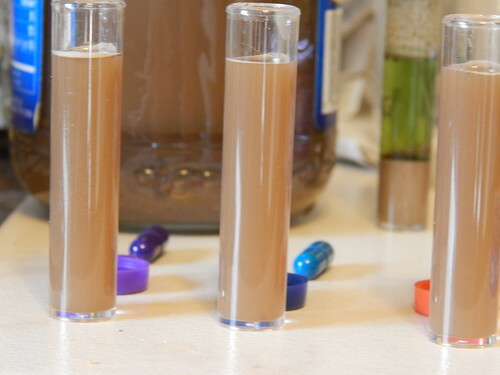 If you submit a lab test where you only took one scoop of soil out of your entire garden, then the results are only applicable to that single scoop of soil. If you mix scoops of soil from your whole garden area, then your results will give you a good average of the area that will result in better recommendations. Posted on March 27, 2014, in Around the Garden, Garden Planning, Techniques to Try and tagged fertilizer, garden planning, garden preparation, nutrients, soil, soil testing. Bookmark the permalink. Leave a comment.